Community-based organizations are in the forefront of dealing with waste management in Nairobi’s informal settlements, however, their interventions often fall short of becoming sustainable and profitable on the long run. Research shows that there is ample opportunity in alternative material recovery, recycling, and sorting of trash in the informal settlements, as well as, in establishing long term partnerships between community-based groups and the city council. Nairobi is experiencing rapid urbanization which brings with it several challenges. Insufficient and poor infrastructure, environmental degradation, overburdened public services, lack of security and corruption are only some of the problems that citizens face every day. Various self-help groups have responded to the lack of public services, including waste management. These groups fill the gap left by the absence of the state or other private institutions. Their work has profound impact on the lives of the citizens, however, due to the age-old practices, and complicated, in some cases non-existing, relationship with the city council, they often fall short of developing their full potential. Waste is largely an urban problem which carries with it global consequences. It is a by-product of civilization and consumer-based lifestyles, linked to progress, urbanization, and economic development. Managing solid waste well is one of the key challenges of the cities and governments. Failing to manage waste properly has direct impact on public health, length of life, and the environment. It is widely accepted that removal and management of waste together with human excreta are two of the most vital environmental services provided by the city. Additionally, waste is closely tied to income, therefore, distribution of waste is not equal in all parts of the world. There are significant geographical disparities in production, composition, and management of waste in the world, and even within cities. Generation of waste as well as successful management of waste involves an interaction of social, economic, governance, environmental, cultural, and technological processes. According to the UN-Habitat’s report, Nairobi generates 876.000 tonnes of waste per year (or 219 kg per capita per year). The city reports 60-70% collection coverage rates – 100% in the downtown business district – with 54% of waste generated being collected.According to the study conducted by the UN-Habitat, the main driver for solid waste management in Nairobi is public health. Waste collection in Nairobi is conducted mostly by the private sector, which consists of companies, micro and small enterprises, and community based organizations. Despite these efforts, the city continues to struggle to resolve its waste disposal problems. Informal settlements often bear the brunt of the missing services. Among other things, they lack proper waste management systems leaving people to literally live on, and sometimes off, waste. Waste is often dumped in the informal communities where it accumulates through time and represents a major health hazard to the inhabitants. Government interventions are often missing or are inadequate to solve the problem of waste in informal settlements. In the absence of government intervention, various self-help groups have formed and responded to the missing provision of public services in Nairobi. The emergence of community-based organizations engaged in waste management within Nairobi’s informal settlements is a case in point. These groups are filling the gap left by the absence of state or private firms. They organize their members to collect trash from the households, sort-out valuable materials and sell them to middlemen and industries, and sometimes coordinate community clean-ups. 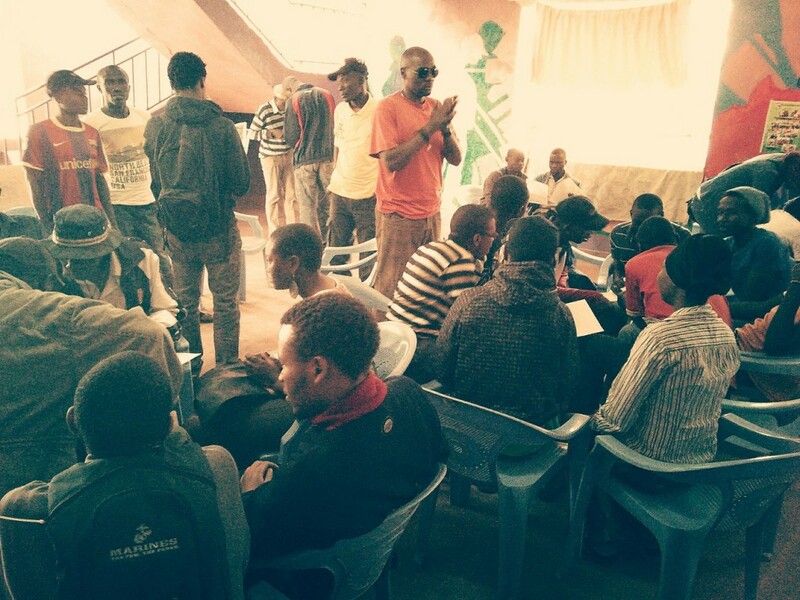 One such groups is Juja Road Self-Help Group – one of many dozens dealing with waste management in Mathare. The “business model” of the Group is relatively simple: it collects, sorts, and then disposes of garbage from households; something that – despite the lack of protective gear and any advanced technology – it does relatively well. The group generates modest revenue through trash collection, as well as basic re-selling of mainly plastics and metals. However, faced with the lack of equipment, funding, and sometimes lack of respect from both the city council and the residents, the members struggle to make ends meet. This forces them to expand to the neighboring communities, as Juja Group did when it started operating in Eastleigh. But expansion is no solution on its own. Their work, and work of other similar groups, has a profound impact on the lives of the settlement’s inhabitants, however, they often fall short of developing their full potential, as their interventions struggle to become truly sustainable and thus fully effective and profitable on the long run. The challenge is significant, since these groups are trying to address what in effect is a large-scale governance failure with limited skills and resources. In a simplistic way, we could think of the problem as dichotomous in nature. On the one hand, the groups, while they possess the man-power, do not have the necessary skill, knowledge, or resources to scale up and expand their activities on their own. On the other hand, the groups lack support from the authorities that could provide the necessary resources. The groups themselves are unlikely to be able to sustain their work over a longer period without a change in their strategy and external support. Let us first consider what the existing waste management groups could do on their own to improve their performance. It turns out: a lot. 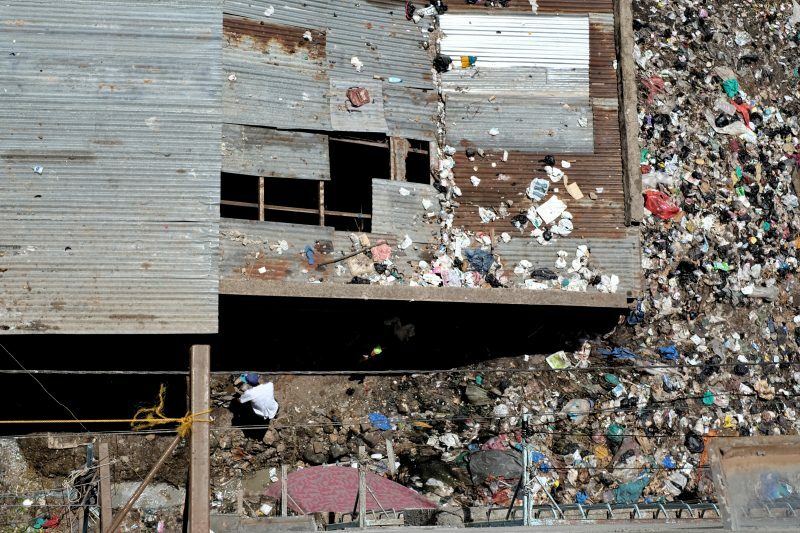 Research that we – Spatial Collective – conducted in Mathare shows that there are ample opportunities in alternative material recovery, recycling, and sorting of trash within the informal settlements. There is much more that the groups could do with the trash they collect. Our research shows that the majority of groups engaged in waste management sort and re-sell only plastics and metals. In detail, 98% of the groups sort and re-sell plastics and 77% metals. Competition is thus fierce, the informal market saturated and – not unexpectedly – the revenue generated from re-selling plastics and metals is very limited. But there remain untapped potentials in expanding material recovery and recycling services. 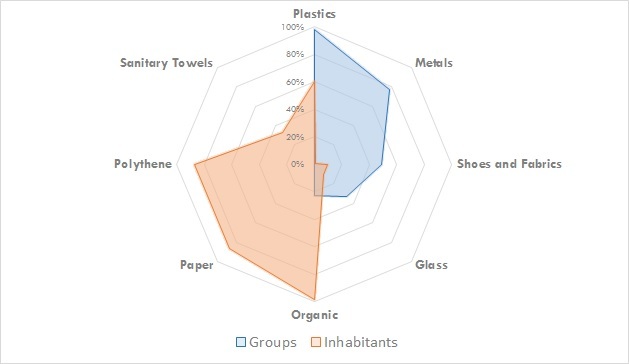 Household data shows that apart from plastics (60%) and metals (surprisingly only 1%), the households also discard organic material (98%), paper (87%), polythene (87%), and sanitary towels (33%). By focusing on the recycling and re-selling of materials beyond plastics and metals, the informal waste management groups would not only reduce the amount of residual waste in the communities, but also secure additional revenue. However, these groups will most likely not succeed on their own and only by improving their waste management practices. A positive relationship with the public authorities is of fundamental importance, on at least three fronts. First, at the most basic level, the city council and the informal groups have to find common ground. While the opponents of informal groups might in theory be right that waste management should be undertaken by public authorities, they fail to recognize that in practice it is precisely because of the failure of these same public authorities that the informal groups have emerged. As long as no credible public alternative is put in place, Juja Road Self-Help Group’s and similar initiatives’ efforts in Nairobi’s informal settlements will remain essential. Second, the allegations that some groups use intimidation and force to enforce the primate over the delivery of public services needs to be addressed. Public goods should not be turned into club goods only enjoyed by some. Finally the informal waste management initiatives do not possess even the basic capabilities to properly dispose of residual trash or to transport it to Nairobi’s main landfill Dandora. Waving this concern away will not solve the problem, dialogue will. In fact, during our interviews many city administrators expressed the willingness to collaborate, yet on the premise that informal groups accept and uphold certain standards – mainly getting themselves officially registered with the city council, and entering in contractual agreements with the city. A certain level of pragmatism and optimism is needed. Informal governance initiatives within Nairobi’s informal settlements will unquestionably remain key for the provision of certain vital – often life-sustaining – services for the foreseeable future. They will continue to serve their communities in the areas of public health, education, water delivery, security, and many others. We believe that this will remain the case also for waste removal. Yet, there is no reason why improvements should not be sought. On the one hand, the informal groups should seize opportunities in recovery and recycling of alternative materials, thus increasing their revenue and ensuring greater sustainability. On the other hand, the city authorities should do more to support some of their activities and enter a constructive partnership to address governance failures. It is important to keep in mind that, at the end of the day, the goal of both sides is to improve the lives of communities in some of the poorest and most destitute parts of Nairobi. Solving the problem of waste and other public services is a matter of urgency and will serve as an indication whether Kenya can ensure long-term sustainability of its economic model.